Ever wondered what the cult cartoon dog and cat duo would look like if they were real animals? You’ll wish you hadn’t after you see THIS. You remember Ren And Stimpy, right? The cult cartoon cat and dog team created by the illustrator John Kricfalusi in the early 1990s. “Stiiiiimpyyyy! You eeediot” and so on? The show always had a grungy, slightly weird feel to it and the characters could often be less than lovable, particularly the psychotic chihuahua Ren Hoek whose mental and physical torture of the hapless cat Stimpy could often get... uncomfortable. So what would Ren and Stimpy look like if they were REAL? Well, take a look at this… if you dare. Sculptor Andrew Freeman produces hideously realistic and scary creations for his company Immortal Masks, including monsters, ghouls, zombies and more. 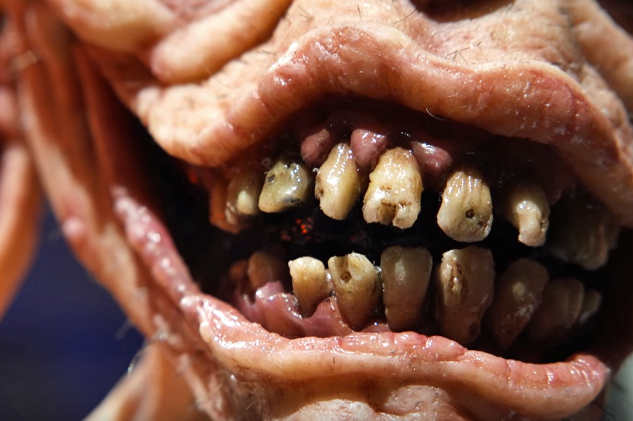 He made the terrifying creatures for an art show in just one week using silicone. And we think he succeeded - here they are, in all their mangy glory. Every hair, every wrinkle, every rotted tooth. Eeew. You can check out more of Andrew Freeman’s work at www.immortalmasks.com.